Be the first to share your favorite memory, photo or story of Justo. This memorial page is dedicated for family, friends and future generations to celebrate the life of their loved one. 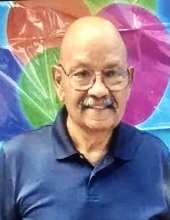 Justo E. Zavala, 72, of El Paso, Texas passed away on January 14, 2019 in Indio, California. He was born September 8, 1946 to Rafael and Benigna (Esparaza) Zavala in Indio, California. He was an Operator for Bermuda Dunes Country Club for over 35 years. Justo is survived by his wife, Lucia Zavala; brother: Pascual E. Zavala of Indio; sisters: Estela Sheriff of San Diego, Esperanza Rodriguez of Indio; and many nieces and nephews. Services will start with a Rosary at 2:00pm and followed by a 2:30pm Memorial Mass on January 31, 2019 at Our Lady of Perpetual Help Church in Indio, California. FitzHenry-Wiefels Indio has been entrusted with arrangements. To send flowers or a remembrance gift to the family of Justo E. Zavala, please visit our Tribute Store. "Email Address" would like to share the life celebration of Justo E. Zavala. Click on the "link" to go to share a favorite memory or leave a condolence message for the family.